NEW THIS YEAR!! 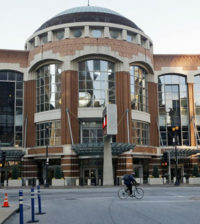 Register and pay online!! 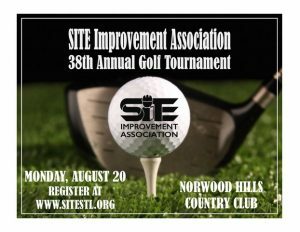 Mark your calendars and arrange your foursome and tee off Monday, August 20 at one of the largest golf tournaments in the St. Louis construction industry! Don’t miss the opportunity to compete for the championships of Flight A, B or C, Closest to the Hole, Longest Drive, or Hole-in-One and enjoy SITE’s ‘delicious’ filet dinner and many excellent networking opportunities! The tournament will be held on both courses of Norwood Hills Country Club. Early reservations are appreciated to ensure an adequate supply of gifts in the appropriate sizes. We ask that your reservation be made no later than Friday, August 10th. Reserve your foursome or sponsorship today by contacting SITE’s office at (314) 966-2950, return this registration form or email rhonda@sitestl.org for more information. Early Registration Discount – Your payment for a foursome will be $950 if registration with payment is received by Monday, July 30. Discount applies to foursome only. All sponsorship levels include company name listed on All Sponsors sign displayed the day of the tournament. Ability to set up your own tent in between the East and West courses to display promotional materials. If you wish to hand out food/drink, please contact SITE’s office. Company recognized as a sponsor with a hole sign on both East and West courses. Company recognized as a sponsor with a hole sign on either East or West course. Company recognized as longest drive sponsor with a sign on either East or West course. Company recognized as longest drive sponsor with a sign on both the East and West course. Company recognized as putting contest sponsor with a sign on either East or West putting green. You are also welcome to set up your own tent near the putting green where the contest is held. Volunteers are always welcomed, contact SITE’s office if you’d like to help the day of the tournament!